CINCINNATI - Amazon Inc. has quietly expanded its grocery-delivery service in Cincinnati to include more than a dozen Northern Kentucky ZIP codes. 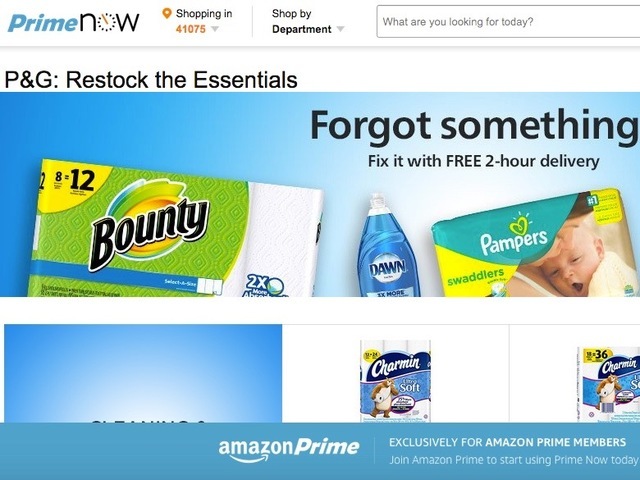 Prime Now, which offers free, two-hour shipping for food, beverage and household products, launched locally in April 2016 with Cincinnati deliveries north of the Ohio River only. Kentucky service wasn’t available last July, when WCPO tested home-delivery options on speed, service and price. Since then, Amazon has announced plans for a $1.5 billion cargo hub at the Cincinnati-Northern Kentucky International Airport and expanded its Prime Now offerings to include beer and wine in Cincinnati and Columbus. On both occasions, the company declined to answer WCPO's questions about a geographic expansion of the Prime Now service in Cincinnati. 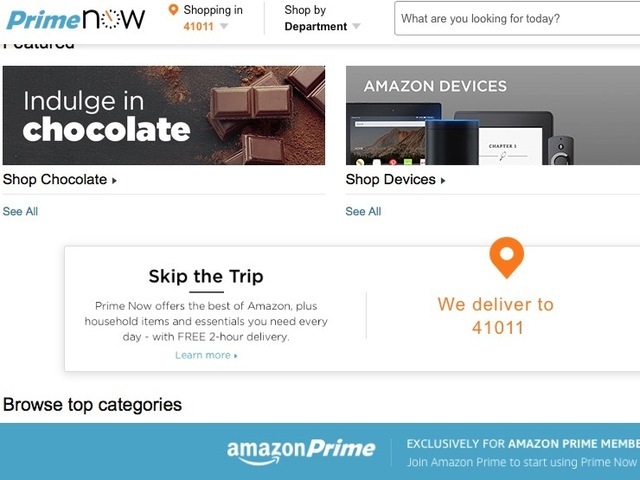 But the company now confirms that Northern Kentucky ZIP codes were added to its local offering in early December, with merchandise shipped from its Prime Now hub in Winton Terrnce. Amazon won't say how many households were added with the expansion, nor will it say how many customers the service has attracted here. “They’re continuing to use the Cincinnati area as a test bed for a combination of reasons,” said Michael Stich, CEO of Rockfish, a digital marketing company that’s helping more than 20 companies navigate the Amazon universe. The Hebron expansion is one reason for Amazon’s ongoing expansion in Cincinnati. Stich believes Hebron’s improved logistics and Cincinnati’s demographics will cause Amazon to expand the roster of products it offers here. The Kentucky invasion – along with recent moves by Meijer Stores Inc. and Wal-Mart to roll out new online grocery options -- will increase pressure on Kroger to roll out a home-delivery option, in addition to its rapidly expanding ClickList option for online orders with curbside pickup. He also thinks Amazon will eventually have to establish store locations in Cincinnati if it really wants to compete for grocery market share. Stich predicts grocery stores will continue to generate foot traffic from “outer rim” products like produce, fresh dairy, prepared foods and pharmacy services, while the “inner aisle” loses market share to home delivery or curbside pickup. Stich thinks online buying – now at less than 5 percent for traditional grocery products – could grow to more than 20 percent in the future. Online orders of personal care products and shelf-stable boxed goods could eventually claim more than 50 percent of all sales, he said. “I see Amazon and Kroger and Wal-Mart, for that matter, having to find some blend of (options) for people to be able to pick up stuff that they want to pick out and experience new and deliver stuff that is a known, repurchased commodity,” Stich said.